Photo by allanparke from the Torontoist Flickr Pool. City council will meet on Wednesday and Thursday to debate the 2014 budget. The debate will almost certainly focus on narrow and sometimes artificial problems: a proposed $6 property tax reduction for the average household, for instance, or whether they can afford to hire five new staffers for the legal department next year (they can). And almost certainly, they won’t pay enough attention in that debate to the impact that their decisions will have more broadly—the way they will shape not just this year’s budget but next year’s, and the ones that follow. Included in every annual budget are projections for subsequent years: what the outlook and pressures are looking forward to 2015 and 2016. According to those projections, next year’s outlook is worse than last year’s. Funding gaps are being deferred, and so too are the tough decisions on how to pay for them. 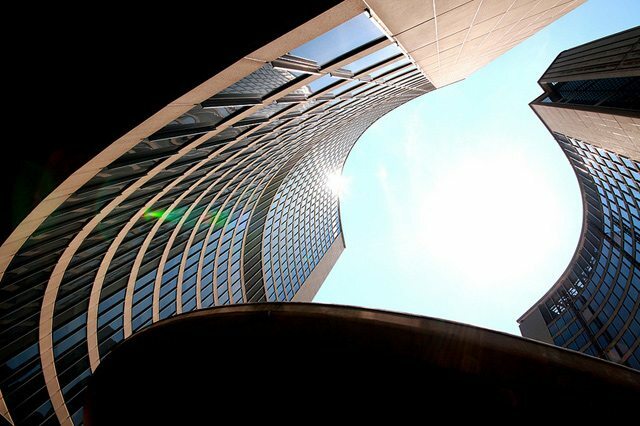 Next year the City will start with a funding shortfall—the gap between how much they expect to raise, and how much they’d spend if they kept the existing services at their current levels—of $494 million. 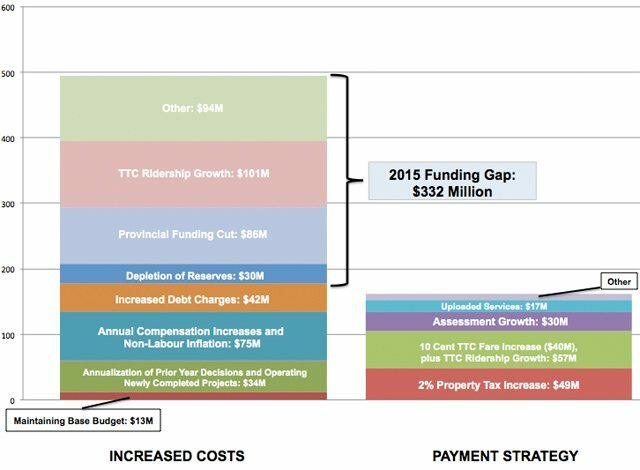 To help figure out how to close that gap, staff project a two per cent property tax revenue increase, some assessment growth, a 10 cent TTC fare hike, some provincial uploading, and increased revenue from TTC fares (because they project an increase in riders), a user fee increase, and some other small sources of revenue. A significant portion of the shortfall is created by Toronto’s unexpected loss of provincial pooling compensation: in June the Queen’s Park announced that this funding, which the City has used for social housing, was to be phased out three years earlier than expected, at a cost of $43 million a year. In the 2014 budget City staff have recommended deferring that problem to next year, to give council some time to lobby Queen’s Park and hopefully reverse the cut. If Rob Ford (or his successor) fails to hypnotize the Premier into changing her mind, that means in 2015 we’ll be dealing with two years’ worth of that cut at once: $43 million from this year, and another $43 million for next year. This is not the only cause of the 2015 budget gap, as there’s also increased pressure on the TTC. The agency’s huge increase in ridership is great in terms of urban policy, but creates a financial difficulty: transit systems don’t make enough money from riders to cover all their costs, and so they always need a funding subsidy to balance their books. (Put another way: every new rider is a new financial cost to the system.) Toronto already gets an unusually high proportion of its transit funding from riders, and unlike most North American cities, Toronto doesn’t get any provincial or federal assistance to operate its transit system. That means that the municipal government will need to transfer more money to the TTC in order to maintain current service levels for the growing number of riders. The TTC also faces annual inflationary pressures for labour and materials. Next year’s opening pressure is projected to be $240 million more than the opening pressure was last year. In order to balance the budget last year council needed to take funding from housing reserves, flatline budgets across most divisions, collect more revenue from the land transfer tax, raise TTC fares, and raise property tax revenues. Next year measures on a similar scale simply won’t be enough. This is not the fault of any one mayor. Toronto has serious structural funding challenges: it has limited revenue tools, myriad infrastructure needs, and a legacy of funding imbalances from amalgamation. All of which is to say: the obsessive focus on whether Toronto can afford to collect $6 million less in property taxes than staff have recommended misses the big picture. When we talk about the 2014 budget, we can’t just assess it based on immediate impacts. There are larger discussions about what services the City should provide, and how it should raise the money it needs—debates about whether we need a sales tax, for instance, or how to convince the provincial government that an investment in the TTC is money well spent. We need to spend more time being honest about the long-term consequences of short-term decisions.